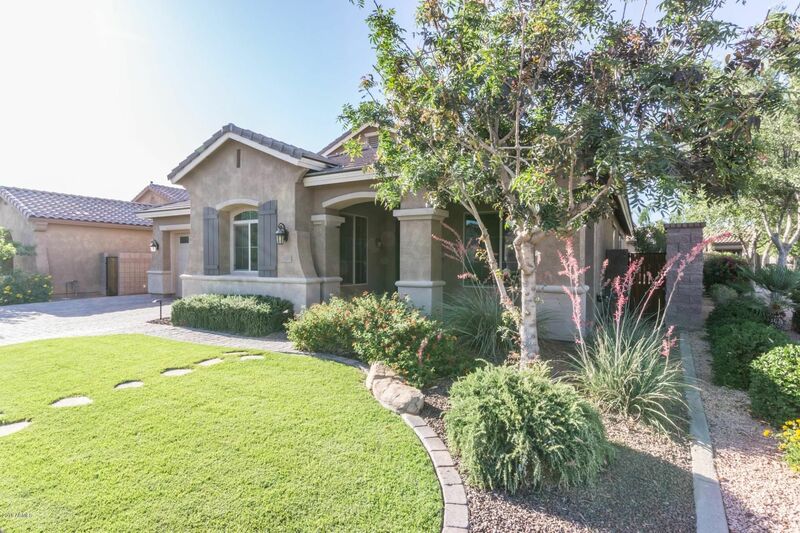 Amazing Fulton Ranch home on corner lot w/3 bedrooms & 3 baths, 2 living, 2 dining, formal study/bedroom with installed Murphy Bed (Queen) with bookshelf banks, & a paradise resort back yard w/htd spa & pool! Plenty of room for outside entertaining! Front entry door is wrought iron & glass, tile & carpet in all the right places. and bamboo flooring in family room. New slate tile facing on the gas fireplace/entertainment center and a large Acacia wood mantel added. Kitchen has staggered upgraded cabinets, granite countertops, pendant lighting over the huge kitchen island/breakfast bar. Gas cooktop, stainless steel appliances & extra-large walk in pantry. The built-in entertainment shelves side up to the cozy fireplace beneath a media alcove. Utility room large enough for that extra fridge.